One of the best ways to protect your business or commercial property is to install security cameras. These cameras will provide important surveillance footage that will be used to monitor your property. These cameras also serve as a deterrent for anyone considering a break in or other crime on your property and can provide evidence for the police if an incident does occur. Because security cameras are so important to the security of your business, it’s important to place them properly to maximize their protection. We’ve compiled a list of the top things to consider for the placement of your security cameras. You know your property better than anyone else, so you might think you can make the best judgments on where to place security cameras. However, if you’re not an expert in security, you might not be aware of some important considerations. If you’re considering upgrading (or simply assessing) the security of your property, you should hire a company to perform a security risk assessment. During this process, a professional will identify all vulnerable areas of your business. In addition to making suggestions for security improvements, the expert will help you properly place your security cameras to maximize visibility both inside and around your building. While they will likely ask for your input to learn about how your business works and which areas of your property are the most important, the expert will have the know-how to determine optimal placement. Many people focus their security cameras on the inside of their building to keep an eye on the goings on of their business and any suspicious visitors. However, it’s essential to cover the entire perimeter of your building. Your cameras should be placed on every side of your building at different angles to ensure 360-degree surveillance. You should also make sure there is at least one security camera pointing at every entrances and exit. It’s essential to monitor who is entering and leaving your building and when to help keep your property safe. 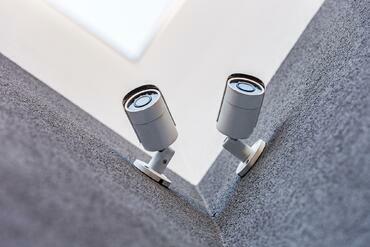 When installing your security cameras, you should use both visible and hidden cameras. Visible cameras are a good deterrent from criminal activity. When people see security cameras, they know they are being monitored and are less likely to commit a crime. However, visible cameras are very vulnerable to damage and vandalism. For this reason, hidden cameras are important to ensure that you still have monitoring capabilities if someone damages your visible cameras. Both of these types of cameras can ensure optimal monitoring capabilities, and the combination will deter potential criminals and keep your building secure. If you haven’t invested in new security cameras in a while, it might be time for an upgrade. Utilizing the latest technology is the best way to ensure that your property is protected to the fullest extent possible. Newer cameras will be able to provide better footage with improved visibility and detail. This improved footage will help those monitoring the footage notice small indicators of a security risk. Newer cameras also have motion detectors that will move to follow anyone in their line of vision, providing the best possible footage. You can also integrate newer cameras with access control and other security features to allow for detailed footage and automatic alerts of suspicious activity. Because your security cameras are so essential to the protection of your property, it’s important to properly protect them. Having hidden cameras is a good step towards protection. You should also make them hard to reach and well secured to their areas to avoid any potential tampering. When you integrate your cameras with other security measures, you can also set up alarms or alerts that will notify you if a camera has been tampered with or if someone attempts to tamper with a camera. Placing your security cameras in the right areas is important, but proper placement won’t make a difference if the cameras aren’t properly protected. We know every client’s risks and business objectives are different requiring customized approaches, policies, procedures and requirements. For 26 years we have brought peace of mind to our clients through the careful application of investigative talent and technology implementation. When it comes to the security of your building, it's best not to leave it up to chance. Be sure that you have made every effort possible to keep your property, employees, and visitors well protected. If you have any concerns, you should consider having your security measures evaluated by a reputable company.